Banff councillor John Cox is backing moves to find a solution for the damaged piers. Specialist teams are being brought in to find a solution for two sagging piers at a historic north-east harbour following months of calls for action. The North Pier at Banff Harbour was cordoned off last summer by the council after an inspection found it was in danger of collapse if there was a storm. Contractors discovered that the levels of grout had reduced and that the large stone blocks built up into the quayside had potentially moved. Repairs were due to begin last August but work was suspended until specialist teams could properly assess the situation. In 2017, temporary repairs had to be carried out after the railway jetty at Banff fell into the water and the south pier was also blocked off due to subsidence. The harbour was built in 1775 and is mainly used by the owners of yachts and pleasure craft, but also local fishermen. On Monday contractors will arrive at the 18th Century harbour to begin vital ground investigation work. They will dig a series of holes in the north and south piers in the hope it can help them come up with a potential fix. It is expected to take four weeks. Phil Helmsley from New Deer keeps his yacht in one of the berths at Banff Harbour and has welcomed the move. Mr Helmsley said: “I’m very pleased to see that the council is taking it seriously and they are attending to the issue. “There is a long way to go yet and this is just an initial investigation to find out what is needed. “You can keep a boat there all year round and looking after the piers is essential. Banff councillor John Cox hopes there will be no “obstacles” carrying out the structural assessment. 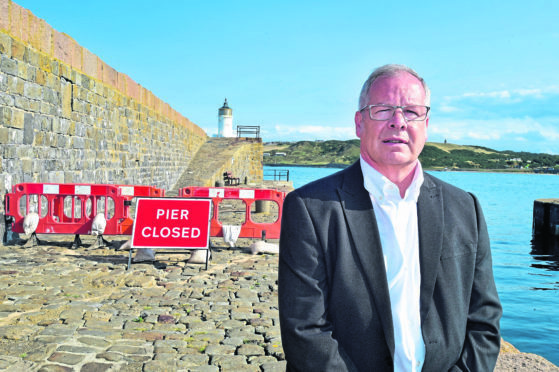 Last night, a council spokesman said the work would have no impact on harbour users and added that pier repairs will begin in the summer. He said: “The ground investigation is a highly specialised undertaking and as such, Aberdeenshire Council does not have the necessary expertise or equipment to carry it out in-house. “Therefore, an external contractor has been appointed. The cost is in the region of £100,000, in line with the budget allocated.